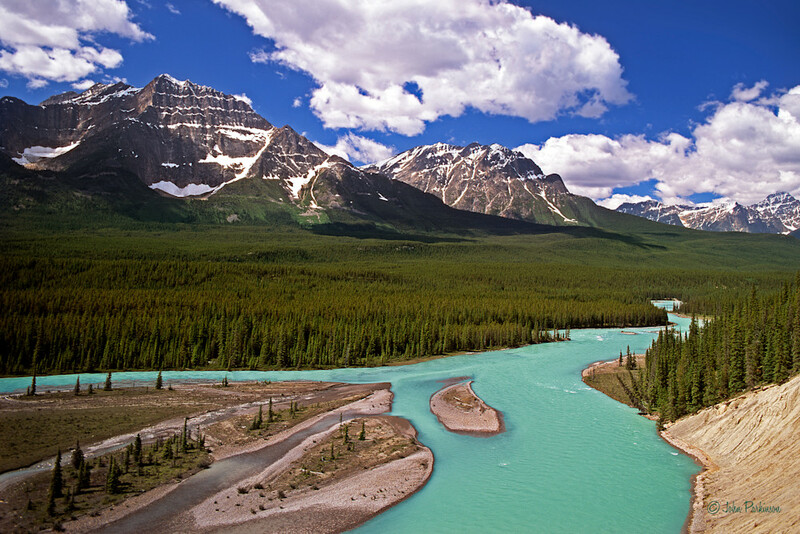 The stunningly beautiful Athabasca River (Athabasca is an anglicized version of the Cree name: āthap-āsk-ā-w meaning "grass or reeds here and there") gets its wonderful turquois color from the minerals of ice melt from the Columbia Glacier in Jasper National Park, Canada. It is the second longest river in Alberta but the largest undammed river. It travels about 937 miles (1500 kms) across Alberta and drains into Lake Athabasca in the north-east, which then flows into the Slave River and joins the McKenzie River, eventually into the Arctic Ocean. Before European colonization, First Nations people, the Sekani, Shuswap, Kootenay, Salish, Stoney and Cree tribes hunted and fished along the river. From the late 18th century the Athabasca River also was a key componenet for the fur trrade route from the Mackenzie River to the Great Lakes. This stunning image of the Athabasca river, framed by the majestic Northern Canadian Rockes, when placed on your wall will certainly bring many positive "wows" and "aaahs" from your appreciative guests.